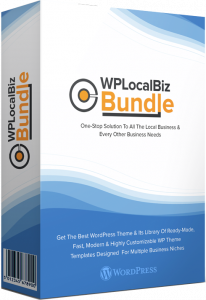 What is WP LocalBiz Bundle? WP LocalBiz Bundle is the collection of some of the best multi-purpose & multi-niche WordPress themes by InkThemes. These themes have supremely easy customization using Elementor page builder and tons of exclusive features as well. To add more power, each theme template is backed up by an Appointment or Service Booking Module! Super Fast Performance: WP LocalBiz Themes is made for speed. It is one of the most lightweight themes available in the market and offers unmatched performance. Ready To Import Websites: With in-built WP LocalBiz plugin, you can browse through several ready-made sites. Import them easily and start customizing..
Customize Without Code: Change the design through a range of options in the WordPress Customizer or Elementor Builder. Requires no coding knowledge. Colors & Typography: Set colors & fonts easily! Stellar Designs: Themes are pixel perfect with every detailing worthy enough to get your website a professional outlook. Gutenberg Compatibility: All the themes have been developed in such a way that it offers Gutenberg compatibility. The new block editor will foster new design opportunities. Strengthen your business website arsenal with the extended library of 15 WP LocalBiz theme templates and the Agency License. On top of this, an elite Video Membership WP theme is also being offered. Two highly functional WordPress themes are inclined towards the directory based and classified listing based businesses. Both the themes are available a single or unlimited sites license.